This manual about Masonry Work aims to help student body to acquire good knowledge skill attitude and experiences in easy life skill related to masonry work. Masonry work is a foundation work of building which requires patience, skillfulness, and strong physical strength, too. Construction sector is growing continuously and rapidly in according to the development of globalization and Cambodia context. 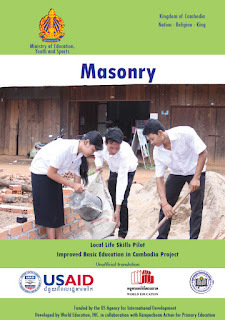 This causes Cambodian youth to be interested in this sector that this requires to a development of a manual about masonry work for practicing in secondary schools in order to contribute to the country development with the royal government of Cambodia It should be noted that this specific manual about Masonry is best to be taught with the help of an experienced bricklayer or technical resource person. This person can supply the tools needed and can assist in the technical aspects in the manual. Without such help, teaching this manual will be very difficult.